Non-tariff and industrial park Nam Dinh Vu (Nam Dinh Vu IP) is located in the center of Dinh Vu - Cat Hai economic zone. This is a synthetic and synchronous economic zone, a multi-sector marine economic center, established to promote the socio-economic development of Hai Phong city, as well as the northern coastal region and the whole country. 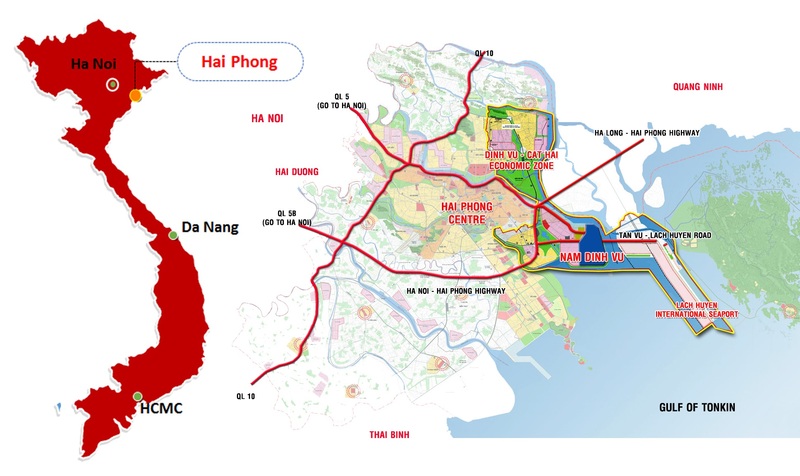 Nam Dinh Vu IP is located in Dinh Vu peninsula, right at the gateway to the sea, nearest to the sea in comparison with other industrial parks in the same area. The area has a wide return area (300m) which able to accommodate up to 40,000DWT vessels. On the waterway, Nam Dinh Vu IP is located downstream of the Bach Dang River, connecting the main channel of the Hai Phong port system through the Trap canal and Ha Nam canal. On the railway, Nam Dinh Vu IP is 15 km distance from Hai Phong railway station. In the future, the Hai Phong - Hanoi - Lao Cai railway route to Kunming, China will be extended to Dinh Vu - Cat Hai economic zone in which Nam Dinh Vu IP to be in the center. The weather in Dinh Vu peninsula two distinct seasons: winter and summer. The climate is relatively mild. Due to lying close to the sea, winter in Dinh Vu peninsula is 1⁰C warmer than in Hanoi, while summer is 1⁰C cooler. The average monthly temperature is from 20⁰C to 23⁰C. The average humidity in the year is from 80% to 85%, the highest humidity (95%) is in July, August, September and the lowest humidity is in December and January. During the year, there were 1,692.4 hours of sunshine. Average ground radiation is 117 kcal cm/min. The wind regime is influenced by atmospheric circulation and varies seasonally. Average wind speed is about 3.5 m/s to 4.2 m/s. This type of climate is relatively favorable for construction and development of new mechanical, metallurgical, new materials plants. Internal roads system: 46m - 34m - 23m. Power supply system: It is supplied from the national power grid through the Nam Dinh Vu 110/22KV substation with capacity of 4 x 63 MVA (phase 1: 2x63 MVA). Water supply system: pipe F600. Maximum capacity of 30,000 m3/day. Waste water treatment: Collected into the treatment plant (phase 1 with capacity of 10,000 m3/day) before being discharged into the environment. Waste treatment: Collected and sorted according to standard level.